Thursday was a relaxing day in a week of tiring ones. I decided to ignore my 9 o’clock alarm, and actually get the sleep that I am entitled to on my week off. Although as the light shines through the curtains it becomes more and more difficult to keep my eyes closed and enjoy the slumber. So I got up. Nevertheless my tiredness didn’t seem to escape; it followed me into my shower and didn’t let me go until I was downstairs having some breakfast. The house was particularly jubilant, seen as it was New Years’ Day in the Indian calendar (saving your question about having a celebration in the middle of October) but it didn’t really feel like a “happy” new year. Since the dawn of time, man has taken this day to reflect and make empty promises to better himself, knowing that this new start is not so glamorous after the day is over. Resolutions. You know, there are more gym membership subscriptions taken in January (Western New Year) then there are in any other month; which shows that people want to start as they mean to go on. But, there are more cancellations of gym memberships in February than in any other month. So I think that sort of speaks for itself. Yes I know I am cynical, but then again at least I am honest about it. I digress. Today was the day when I was going to go and have some lunch with a friend, someone who in her own words is “so beautiful and clever and smart and kind and generous” and “the most awesomest person in the ever” (direct quotes). I know that she will be reading this in anticipation so I am going to leave the descriptions there, in case I put my foot in my mouth (yes, and I think that may have just happened). Well, we decided that she was going to take me to one of her favourite restaurants and that we were going to try something different. I was intrigued, I was not fussy with food, and judging by the size of my belly, there can’t have been many things that I hadn’t come across before. And I was right, and so was she, it was different, but the same. I am going to explain, don’t worry. Well, it was a classic Italian restaurant with all the pizzas, pastas and tiramisus that you would find normally, but the service was different. You queued up for your food behind stations (which I was not a fan of at first; it reminded me of bus stops for some bizarre reason), but then you ordered and it was made fresh in front of you to your tastes and requirements. Most of you are probably going that is not different at all, look at Subway, but the thing was that the ingredients were really fresh and there was a better atmosphere than employees just throwing stuff into the microwave and waiting for the “ding”. I ordered pasta and not only was it a healthy portion, but it was also spicy and to my taste, which is difficult to get in those sorts of restaurants. I highly recommend the place, it is called Vapiano’s and I am sure that my friend who is reading this is smiling because I am recommending it to you guys. It was a nice day and we got to chat about what we had been up to and how everything was going. The thing that I like about her is that the conversation is never too awkward and she always has an infectious laugh to break any of that up. At the same time, I think that we just sort of click which is nice because I have not had that sort of connection with many people recently. It also helps that we are sort of on the same wavelength and we have the same sort of views. Also we can just have a laugh, and I can take time out of my busy lifestyle and not have to think about anything in particular and just have fun. You have probably guessed that she is a dinner friend, or maybe more appropriately a lunch friend in this case. For me, holidays are the busiest times of the year. Many people think that it is a time to relax and recuperate, and I don’t know how many stories I have heard of people being “bored” with “nothing to do”. Well for me it is the exact opposite. Term time seems to be the time when I am in a solid routine and I know what the challenges are everyday – it could be why I find myself so many other things to keep myself entertained; but when I have a week off or a month off, so many things crop up that I could be doing any number of things on the same day…that is a completely different challenge. For example, before I had my compulsory week off in October, three weeks before, I had already booked myself up for 5 out of the 7 days (I don’t know how either!) and so my head had to be in gear when it should have rightfully been glued to my pillow. But I mustn’t complain. The first thing to say about Wednesday is that it was Diwali. The festival of light. The triumph of good over evil. But I am sure you know the stories, so I am not going to go into it (if you don’t know, Google it). The thing about Diwali that most people don’t know is that it is not just one day, but five days of festivities, which this year coincided with my holiday. I mean this was a good thing in one way but in another way it was difficult. I mean I know that it was important, and I understand that, and I made the effort with all of the things that I should do, such as the prayers and visiting family and cooking, but it always feels like a super pressurised time. And the fact that I already had a million other things swimming around in my head, didn’t really help. Having said that I really enjoyed it and the food as ever was great enough to require an extra 1000 hours of exercise to work it off. And everyone does make an effort, even people I saw on the Tube that day said “Happy Diwali”, and for those of you that know the London Underground know that people don’t make eye contact, let alone conversation on the Tube, if they don’t know you. But at the same time, I guess I am not a typical festivities kind of person, I don’t “feel” it, if you know what I mean, and so it all seems to go way over my head. But I mustn’t complain. Although that day was still a pretty good day. I got to meet a friend who I hadn’t seen for a little while (yes, she was a dinner friend in case you were going to ask) and she is not from London so it made it all the more sweeter I guess. We have only known each other a short while, but I guess we have a lot in common so it seems like we have known each other a lot longer. I think the thing is that you come across people like that in life, which seems to come at just the right time. This was definitely the case. I had a plan for the day to show her around a part of London that she probably had not seen before, but there was one thing that got in the way. Good old British weather! It rained so much that we just decided to sit in the dry and just have a really good chat, so it wasn’t so bad. But then again, I mustn’t complain. This day turned out to be even longer than I thought as I made my way to an event that a friend of mine was running as part of the business that he heads up. 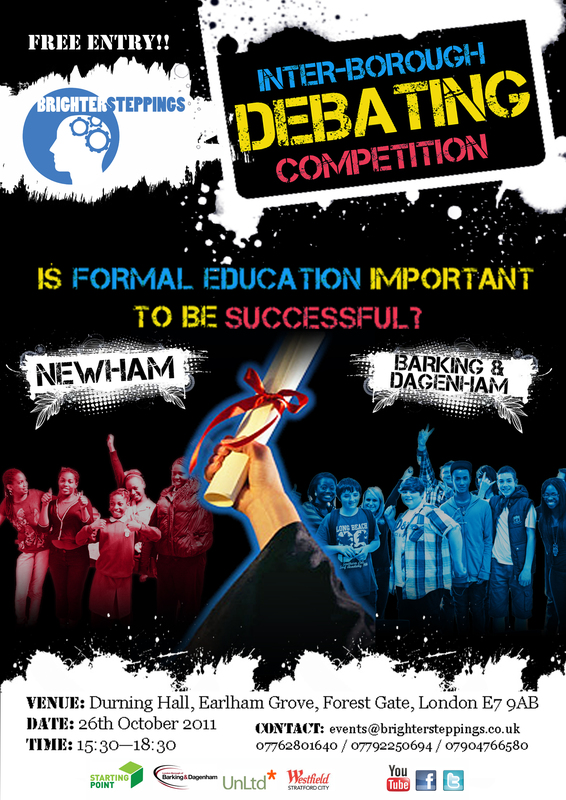 It was an inter-council debate of young people from Newham and Barking & Dagenham, around the topic “Was formal education needed in order to become successful?” To be honest, I wasn’t sure what to expect, as I had been to formal debates before, and I had the notion that this was not going to be in any way formal. But I was pleasantly surprised, the speakers spoke articulately and clearly and each of them had something different to say which made the argument much more interesting. I was erring towards the side of formal education because of my ambitions to go to university and so on, but I could see that the other side has equally valid points about the fact that experience and education go hand in hand and the numbers of youth unemployed raised the question whether the system was working at all. The whole event showed me that I should be more open-minded about things and go with no expectations, because to be honest, I was not expecting what I got at the beginning. I have to commend Seun (that is my friend) on the way that he did it and put it together and Lara (his business partner) on the food and the general organisation. Although, because of the ever reliable Tube, I got home late and probably got ill because of the frightening cold (thank you weather again! ); but once again, especially this time, I mustn’t complain. Tuesday heralded another early morning, dragging myself out of bed and throwing my phone across the room for ringing from the alarm that I had set up the night before – no, I am not an early morning person. But I am glad that I was able to get up because the reason for it was very exciting for me. As part of the business that I run (although I won’t go into it now, but if you want you can ask me about it later) with the help of some of my colleagues, I was able to take a workshop to help a group of young people with learning difficulties to create a film about a project that they were running. Interesting stuff huh? – Definitely worth the early morning start! Although the only problem was that this place was not easy to find, and my sense of direction is notoriously terrible, so it was more like a mission in the morning. Me and a map is kind of like a monkey with a toothbrush, he knows what it is for, but he has no bloody idea how to use it…and it was in Tottenham so not a place that I could ask directions in easily without coming across like a pretentious tourist. So I called in reinforcements. I decided that it was better to travel in numbers than by myself, so I would less vulnerable prey – thank you Sir David Attenborough for that pearl of wisdom (and I don’t know why I am going through animal analogies…bear with me! )Well, I got to Seven Sisters station (no idea why it is called that) and we spent 50 minutes walking a mile in every direction until we found that the place was right next to the station. Being late. Not a good start. Luckily we had time to set up and we were ready and raring to go when the young people came to the building. It was a refurbished power station, so it had all the old tools, like 6ft spanners and massive cogs, so it just added to the prestige of the place, which was like a little part of the countryside in an urban part of North London. The youth group were called the Markfield Project. I would be lying if I said that I was not nervous to take this workshop, as we had no idea how severe these disabilities were going to be. And then I thought that it doesn’t matter and if I kept thinking about it, then it would stop me from seeing them as people like me, and that would be wrong. Well anyway, they were some of the loveliest bunch of people that I have come across; even though it took them a little while to get comfortable with us, they were not shy, they participated and they were genuinely passionate about their idea, which was a project to buy special bikes for people with disabilities so that they can learn how to ride and use a skate park that was in close proximity to the youth centre like everyone else. In the morning, with the use of lots of pictures and games, we were able to get an idea about what their project was about and also get to know them so that we could assign roles in the afternoon. We then, after lunch, got them to do a film explaining what their project was about and demonstrate how to use the bikes. We did this for two reasons; the first to get them to celebrate their idea and go through how they came to get it (they had been working on it for a really long time); and second, with this video they could then pitch for funding so that they could carry this wonderful project on. So we filmed and then I went through the painstaking work or editing it and we were really happy with the result. I got there nice and early, wearing formal, yet comfortably fashionable clothing and realised as soon as I sat down on their leather chairs that I was probably going to enjoy this. I know quite a few people studying and working in the law, so I was not fazed by my surroundings (but I could see why you could be) but at the same time I had the same reoccurring thought…I don’t belong here. Then I saw the swimming pool. I changed my mind. They say that you should not be taken in by the gimmicks in a job and rather base your career decisions on what you are really interested, and that is absolutely true; but at the same time if someone offers you a free gym membership just for turning up to work, then you don’t say no. I know that some of you may be thinking that I am a materialistic so and so, but I am just being honest. For a split second, that is how all our minds think, but then it hit me. All of the hairdressers, free drinks and spinning classes are not just as a bonus…they put them there so you never have to leave. You can literally eat, sleep and work without ever leaving the (un)comfort of your office…a scary thought. 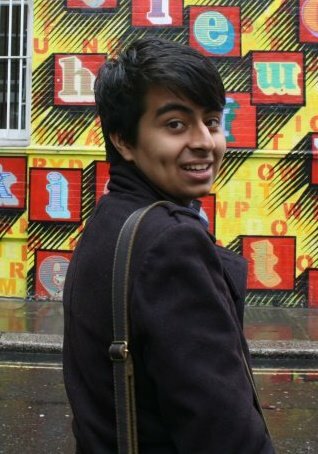 After that revelation, I was on my way out of Canary Wharf and on the tube towards Aldgate. After taking part in the Money Apprentice two years ago, I was invited to come back and facilitate, although you probably have no idea what I talking about. Well, I attended this course in the summer in order to brush up on finance in the real world sense (not the long division, waste of time, GCSE Maths sense) and it helped young people to develop knowledge about financial terms, saving, budgeting and being savvy, At the end of the course, I was lucky enough to pitch to some professionals on what I had learnt. They must of liked it because one of the gave me work experience a few months later (result!) and I have stayed in touch with the teacher that took it ever since. So coming back to step into her shoes was a bit of a proud moment for me, while at the same time, completely ridiculous. After getting there and seeing how the course had changed over the years and how different the type of crowd was made me think about how far I had come in two years. I mean it is sort of like growing up with your brother, he gets taller and taller every day, but because you see him often you don’t notice. It is only after he goes away for a while and comes back that you realise how tall he has actually gotten. It is kind of like that.